I have always been drawn to cowhides, and have had a few. 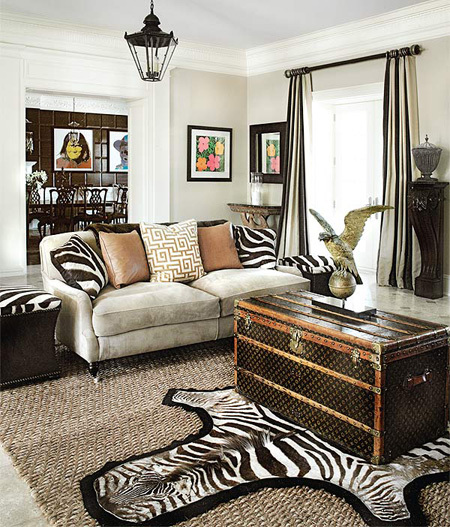 But lately I have really been wanting a zebra hide. 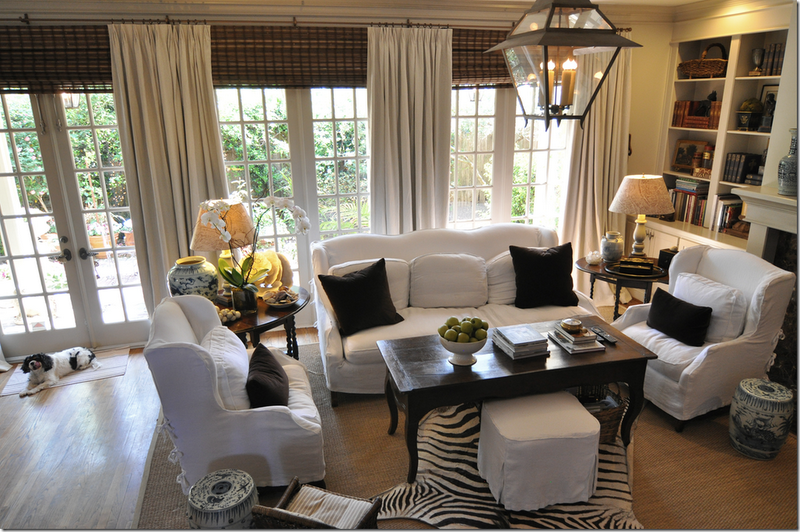 I'm sure it grosses some of you out, but I love them, especially layered over natural rugs like sisal. Problem is, they are soooo expensive! I know you can buy cowhides dyed to look like zebras, but I still haven't found one in my price range. Years ago I had one. Some friends of ours were getting rid of it. They had hunted it themselves in Africa and made it into a rug. Problem is, it had a head on it, and even though I tried to make it work, it freaked me out every time I looked at it. We ended up giving it away to a college kid who hung it on his dorm wall. Anyone know of anyone selling one? My favorite image of all is from none other than Cote De Texas~big surprise! I don't have a giveaway this week~sorry! We are actually leaving town Wednesday through Monday for a camping trip. Sorry, but they are simply not ethical. As beautiful as they are they look much better on the Zebra. If I would have known earlier I could have picked one up for you in Africa... :)When I came back from my trip I noticed I wasn't on your blog roll anymore... as you know many of my visits came from your awesome blog... :) If you are adding stores again I would love to be there. Have a super fun time at Farm Chicks...I can't go this year...bummer. It's a fun look...my daughter loves zebra prints on pillows and such. Have a great time at the event! 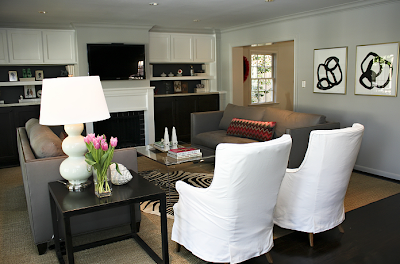 How do you figure out how to layer rugs? 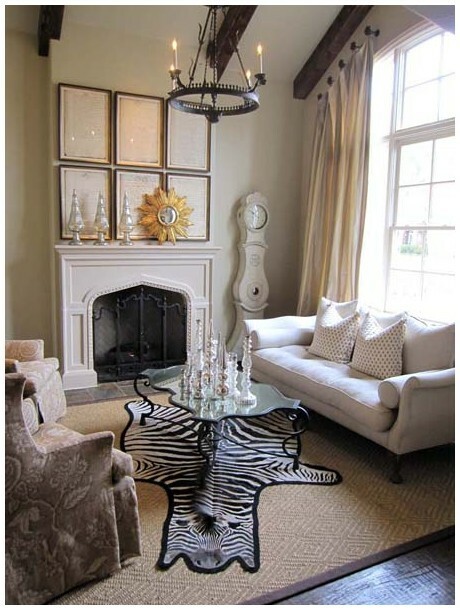 I am not into animal myself but I do like the look of the layered rugs but I don't know how to do it. Suggestions? I love the look, but I am against using the natural hide of a beautiful animal that should still be ON the animal. I am not one of "those people" who is crazy about animal rights, etc. I personaly think it is selfish for a beautiful animal to die because someone wants its hide to grace their floor. We may need to eat beef (a burger is my favorite food)and wear shoes (more 'killing cows') etc, but this just seems a bit superflouous. Sorry- just my opinion. Can't you find the look of zebra? There are plenty of resources for natural hide (not necessarily Zebra) out there Melaine. Try these guys http://proinleathers.com/index.htm They sell on Ebay as well. Sounds like your going to get a little flack for this post. I for one would find it a bit hypocritical for anyone to leave a negative comment when most couldn't say they didn't own a pair of leather shoes, purse, wallet, or coat at least at some point in their lifetime. If we eat beef (which most of us do) why not be respectful of the animal...not only being less wasteful, but indeed, paying homage to its beauty? They are unique but I'd go for the faux if you can find one since the real thing is so costly. Have fun camping! How about truly showing your love for this animal AND a truly creative genius by PAINTING zebra stripes on rug sized canvas? This is not ethical... sorry. Last time I checked, we don't eat zebra so no reason to have their coat. 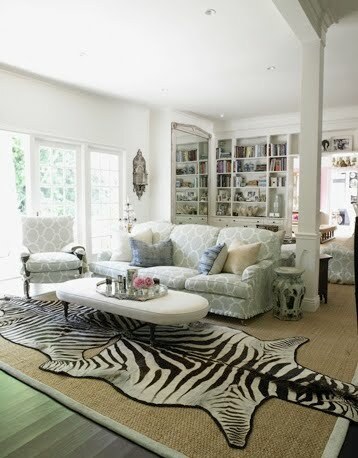 A zebra rug with the head would most definitely freak me out too. I'd go faux but even that isn't cheap. And I've just stopped following this blog now :( As a vegetarian and animal rights activist, I am sickened by this. بسم الله الرحمن الرحيم قال سبحانهُ وتعالى في كتابهِ العزيز ( وَجَعَلْنَا مِنَ الْمَاء كُلَّ شَيْءٍ حَيٍّ أَفَلَا يُؤْمِنُونَ ) الأنبياء - صدق الله لذلك جميعنا يعرف قيمة المياه جيداً, والحفاظ على المياه من الفقدان بالطُرق الغير سليمة أمرًا ضرويًا للغاية وهو واجب دينيّ في المقام الأول قبل أن يكون واجب أخلاقي و من أجل أيضًا عدم إهدار المال ودفع فواتير بمبالغ مادية مرتفعةٌ. كوكب الأرض بمرور الوقت يفقد الكثير من المياه لذلك نبذُل أقصى قصاري جُهدنا للمحافظة على المياه, والرغم من الجهود المُضنيّة للحفاظ على المياه, يتم فقدان الكثير من المياه في المنازل والمولات والفلل وبيوتنا والأسواق التجارية, ولكن عندما نواجه تسرب المياه من الأنابيب علينا إصلاح العطب بأقصى سرعة من أجل الإستفادة من المياه وعدم إهدارها بطريقة سيئة, لذلك يمكنك الإتصال بأفضل شركة كشف تسربات المياه بالمملكة العربية السعودية لإصلاحها. الدليل السعودي يُساعدك على التعرف والإختيار بين أفضل الشركات الخدمية المتواجدة في المملكة والتي تقدم خدمات مكافحة الحشرات وإبادة القوارض ورش المبيدات وخدمات نقل وفك وتركيب وتغليف وتخزين العفش والأثاث وخدمات التنظيف مثل تنظيف المنازل والخزانات وتنظيف البلاط والرخام وتلميعهُ, وأيضاً خدمات عزل الخزانات المياه وكشف تسربات وخدمات تسليك المجاري وتركيب السيراميك وتنفيذ أعمال الدهانات والكلادينج. والهدف الأساسي توفير جميع الخدمات للعميل السعودي ليستطيع الإختيار بسهولة للغاية والحصول على مبتغاه من الشركات القوية للغاية وتم تقسم الموقع إلى عدة أقسام رئيسية بالخدمات التي تقدمها الشركات المتواجدة في كل منطقة من مناطق المملكة العربية السعودية.